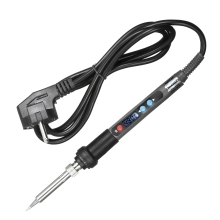 This electric soldering iron comes with LCD display and 900M heater tip. It has temperature setting function that you can adjust it to a suitable temperature for different projects. It&apos;s a great tool for electronics, computer equipment, watch repair and other craft projects. Temperature Range: 100～480℃ for using with constant temperature with built-in mini CPU digital control circuitry to control the temperature critically. Adjustable Temperature: Set the desired value to meet your soldering needs. Top Temperature Sensor Design: The tip with quick temperature induction, can sharply reduce the temperature drop phenomenon of the welding nozzle in the process of working, suitable for lead-free process technology. New Design: Latest heat dissipation handle design, comfortable hand feeling for long term use, patent tail handle line pressing design is more secure to solder. LCD Display: LCD digital display to show the temperature clearly. Plug-pull Tip Design: Easy to install and replace the tips, time-saving and efficient. Safer & More Stable Performance: The circuit board is double-sided gold plated. Lightweight and Portable Size: You can start soldering anywhere at any time without feeling fatigue for long period of operation. Longer Life with High Quality: Heat-insulated and non-slip silicone handle provides comfortable and secure operation. Please do not touch the soldering tip metal part when the power is turned on. Please turn off the power when resting between usage or finished soldering.